For the famous birthdays of March 9, number nine could be their lucky number. 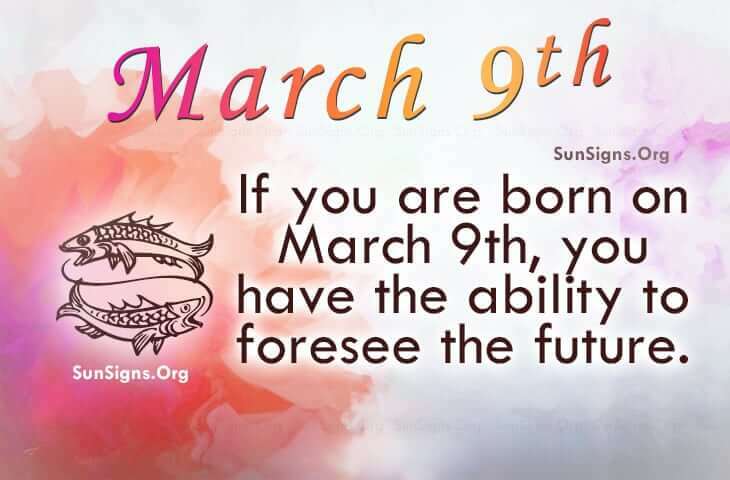 The famous March 9 Pisces are typically people who have the ability to foresee certain things. It is something that they take seriously and use it in a productive way. They are delicate and insecure people. Nonetheless, famous people born on March 9th are able to make the best out of any situation. They are known for making peace in conflicting situations. But there are times when their loved ones must hold them up when they need a lift. Famous people born on 9th March could take time to reflect on the past. They should also practice yoga techniques to help relieve themselves of stress and to develop and maintain fitness goals. Getting away from the drama always does the mind good. It’s nothing for them to go on a weekend trip for a romantic holiday or for fun with their friends. Famous people born on March 9 have the zodiac sign of Pisces. They are helpful and could possess spiritual qualities. Nonetheless, they struggle with being a parent. In the kitchen, they can be an excellent chef. Including a glass of wine with dinner could help them relax.